Fortuitous thoughts of an exCEO,currently Director, who has been in corporate management for more than three decades...well exposed in international business .....widely traveled around the world....senior citizen and a grand father in personal life who has crossed sunset of his life span ... This blog is DEDICATED TO RESIDENTS OF DOHA - nationals and expatriates alike... with whom I could interact very well all these years..... I could expose myself to a different corporate, cultural world. 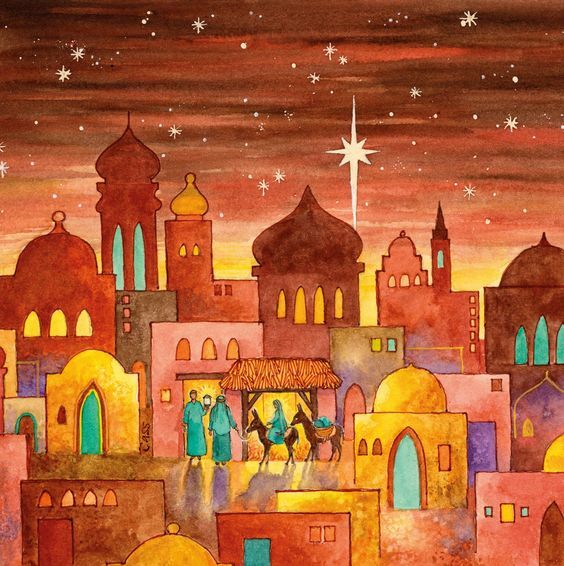 THEY CELEBRATE CHRISTMAS DAY TWICE AT BETHLEHEM! One more Christmas has come and gone. It is known that Christmas is celebrated universally which has become the most popular festive season the world over. Christmas is derived from 'Christ-Mass' of the church that celebrated the birth of Jesus in midnight. In fact no date of birth of Jesus is noted in Bible. For the first three centuries after Christianity was born, no Christmas was seen to be celebrated as recorded in history. When did we start it? How it was fixed on 25th of December? Many of us may not know that it is not necessarily done on 25th December each year, since Christmas is also celebrated on 7th January in many countries to this day. In Bethlehem, birth place of Jesus Christ, it is celebrated on both days-25th December and 7th January!Greece,Russia and Eastern Europe,Egypt,Serbia,Armenia,Georgia,Ethiopia....in 16 countries or so it is January while US, most of Europe and rest of the world it is on 25th December. Why it is so? A historical rather than theological musings on the subject. Palestine, where Jesus was born was of Jewish society but under the rule of Roman Empire, the reigning world power those days. Romans believed in their own Gods. Their might never allowed them to tolerate any other religion or God which questioned their belief and authority. In Palestine the local Jews neither liked the teachings of Jesus Christ, a Jew by birth. They thought he was questioning their very beliefs and traditions. Story of Jesus is too well known to all of us to be repeated here.After crucifixion of Jesus, his disciples decided to spread His message to rest of the world and accessible to them. Few of them went to Greece,Egypt,Syria,Turkey,Ethiopia,...... where one will find some of earliest Christians. St. Peter went to Rome. St. Thomas reached India. Almost all of the disciples of Jesus were killed tragically by others in foreign lands, a historical fact little known to others. In Rome early Christians were persecuted by the emperors who proclaimed that the new religion was evil. Fed to lions and the sorts.St.Peter is believed to have been crucified on the cross. He chose to be on an upside position on the cross-did not want to emulate position of his master, it is said. Similar was the fate of any new convert of Christianity anywhere in the Roman kingdom for few decades which covered almost half of the world. Then something unbelievable-Christian believers call it a miracle- which is recorded in history happened. The Roman Emperor himself became a Christian! Emperor Constantine declared Christianity as the empire favored religion! !It was him in the year 336 who celebrated birth day of Jesus for the first time. Few years later Pope Julius I declared Christmas day on every 25th December. The date was so fixed as per the Julian calendar created by Julius Caesar in 46 BC. Pope Gregory ,Gregorian calendar and Eastern Churches..
Pope Gregory Xiii was interested very much in Astronomy, unusual for a Pope. Based on his studies on Vernal Equinox he came out with a correction of 10 days(13 days for some) to existing Julian calendar. He decreed that 5th October will be called 15th October in AD 1582.Roman Catholic church accepted it.Eventually in the world as a whole this calendar became the most popular albeit Hindus,Muslims,Buddhists,Jews....all have their own calendars but follow the Gregorian calendar in general. Eastern churches-Orthodox,Coptic,Assyrian,Ethiopian,Russian,Armenian-independent from Pope, opposed it and wanted to continue the old Julian calendar for celebrating Christmas. They adhere to their stand to this day in those countries where they are! Thus 25th December each year of Gregorian calendar is only 15th December as per Julian calendar- the Eastern church Christmas Day falls on 6th January. In Bethlehem and other holy places in Palestine and in Israel , they celebrate Christmas on both days respectively, perhaps the only place in the world to do so. When I visited there 12 years back what I could make out was that physical holdings of Eastern Christianity factions over holy places are much more than those by Papal to this day. Having traveled all over, I believe that Kochi could be the city in India where Christmas is celebrated with most fervor. And understandably so. There are only around 2 % Christians among population of India while half of them is in the state of Kerala where Kochi,commercial hub of the state is located.Kochi is also the place where one can find maximum number of churches in India while Kerala remains the ideal state where people from all factions of religions-Hindus, Muslims, Christians- mix and interact freely as a society to this day. Few of Eastern states in India comes next to Kerala in number of churches.Goa comes next to that only, a popular myth among Indians and others who think otherwise. In India, Christianity has a legacy of over 2000 years. One faction of Indian Christianity-Saint Thomas Christians of Kerala started by none other than Saint Thomas, one of the disciples of Jesus Christ- is one of the oldest in the world- while most of the other factions in India are converted by Portuguese, other Europeans and others in the 15th century or much later! Thanks to Indian mentality and culture then and now, not only that Christians are never persecuted but the community thrived well over the years. In many countries in the world I am aware first hand, how a minority community is treated by the majority community of population. Is it AIR INDIA company or EAST INDIA company ? DID REV. MALTHUS GO WRONG IN INDIA ? A POPE FROM LIBYA ? A COUNTRY YOU DON'T KNOW.. HAPPY BIRTHDAY MICKY ! HAPPY BIRTHDAY MIA !